In all the dark pages of the supernatural there is no more terrible tradition than that of the Vampire, a pariah even among demons. Foul are his ravages; gruesome and seemingly barbaric are the ancient and approved methods by which folk rid themselves of this hideous pest. The tradition is world-wide and of the greatest antiquity. How did it arise? How did it spread? Does it indeed contain some vestige of truth, some memory of savage practice, some trace of cannibalism or worse? These and similar problems inevitably suggested by a consideration of Vampirism in its various aspects are fully discussed in this work which may not unfairly claim to be the first serious and fully documented study of a subject that in its details is of absorbing interest, although the circumstances are of necessity macabre and ghastly in the highest degree. Included in this critical edition are the authoritative text, rare contextual and source materials, correspondence, illustrations, as well as Greek and Latin translations. A biographical note and chronology are also included. 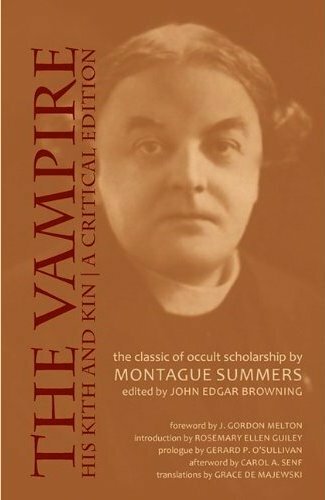 The latest edition of Montague Summers' very first literary foray into the world of the undead (published by Kegan Paul, Trench, Trubner in 1928) is edited by John Edgar Browning with an Introduction from Rosemary Ellen Guiley (Vampires Among Us, 1991; The Complete Vampire Companion, 1994; The Encyclopedia of Vampires, Werewolves, and Other Monsters, 2004/2011; Vampires, 2008), and an Afterword by Carol A Senf (The Vampire in Nineteenth Century English Literature, 1988). A Foreword is offered by J Gordon Melton (The Vampire Book: The Encyclopedia of the Undead, 1994/1999/2011). John Edgar Browning (born 14 October 1980 in Nashville, USA) is a PhD. student and Arthur A Schomburg Fellow in the American Studies Department at The State University of New York at Buffalo. He has contracted and co-written eight books, including Draculas, Vampires, and Other Undead Forms: Essays on Gender, Race, and Culture (Scarecrow, 2009); Dracula in Visual Media: Film, Television, Comic Book and Electronic Game Appearances, 1921–2010 (McFarland, 2010), The Vampire, His Kith and Kin: A Critical Edition (Apocryphile Press, 2011), and Speaking of Monsters: A Teratological Anthology (Palgrave Macmillan, contracted and forthcoming); chapters for Asian Gothic: Essays on Literature, Film, and Anime (McFarland, 2008), The Encyclopedia of the Vampire (Greenwood, 2010), Nyx in the House of Night: Mythology, Folklore and Religion in the PC and Kristin Cast Vampyre Series (SmartPop, 2011), and Schooling Ghouls: Interdisciplinary Approaches to the Pedagogy of Horror (accepted and forthcoming); plus articles for various journals, including Film & History, Horror Studies, Studies in the Fantastic, and Dead Reckonings: A Review Magazine for the Horror Field. Additionally, he has spent nearly two years conducting an ethnographic study of persons living in New Orleans who self-identify as vampire, a project that has become the focal point of his doctoral dissertation.